BETA 3.22.2.4 new export. When automated export to Cater, Locus reports an error. The export went well, see. SCR. So far only once, it can be a coincidence. I will continue to test. CZ: BETA 3.22.2.4 nový export. Při automatrickém exportu do Stravy hlásí Locus chybu. Přitom export proběhl v pořádku, viz. SCR. Zatím vyzkoušeno jen jednou, může to být náhoda. Budu testovat i nadále. The route was again legally exported today with a green window of successful export. Yet, again, the manager reported a failed export report. Thanks Josef, I see same problem now on own device. Will fix it. - news after start, but main work was done on improving Route planner if few ways (more in news). Let me know (best in mentioned topic in news). Thanks and have a nice weekend! It's great! Is it possible to change the name into the selfmaked profilname? Conversion of the route works well. But I use modified profiles with my own names. However, these names will not appear in the recalculation, instead of the original name. It's just a little thing. Anyway issue You and @erfi reported: thanks, it will be possible, I'll look at it. In the new Beta version of the route export, it works well. I just think it's a double report. The green window first flashes: The process is successful. Then there is a report about successful export in the manager, which I also have to manually remove. It is not useless? I apologize for the non-standard profile assignment. As you write, it's a habit. Unforgettable times do not mind me, I do not see any, just a dash. This will definitely be the result of my own older Brouter profiles, which, however, are tuned exactly to my needs. I can estimate the time on my way alone. CZ: V nové verzi Beta zobrazení exportu trasy funguje dobře. Jen mi přijde, že je to zdvojené hlášení. Napřed blikne zelené okýnko: Proces úspěšný. Pak ještě hlášení o úspěšném exportu v manažeru, které navíc musím ručně odstranit. Není to zbytečné? Za nestandardní přiřazení profilů se omlouvám. Jak píšeš, jde o zvyk. Nespávné časy mi nijak nevadí, nezobrazují se mi totiž žádné, jen pomlčka. To bude určitě důsledek vlastních starších Brouter profilů, které mám ovšem odladěny přesně dle svých potřeb. Čas na cestě si dokážu odhadnout sám. Ah circles ... an unwanted side effect of larger circles with profiles in route planner. Thanks, will fix it. And times, well ... . Hopefully, there is always space for improvements! 3.32.2.7 Route Planner - a joy to use - well done @Menion. New track point icon - nice. Bug (maybe) - when a Navigation (small blue) point is selected then deleted by tap of Bin icon the small blue icon on the map remains and needs repainting without any point? If I tap this small blue point it is described as a track point? 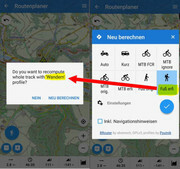 Suggestion - when a track point is selected display the GPS location in same way (bottom line) as a Via point, and thus allow this point to be moved by tapping the Circle/ Dot icon. This avoids having to drag the track point icon which only works over the visible screen distance, and I have sometimes found quite error prone - tap then immediate drag. "Nice", glad to hear it . I also think that now is work with planner again a little easier. Bug: will check it, consider as fixed. Suggestion: coordinates are now visible for shaping points (green triangle) and via points (blue square) that define the shape of the route. For other points, it does not make sense, because moving of navigation point or a single trackpoint just break computed route. Or did I understand incorrectly? For other points, it does not make sense, because moving of navigation point or a single trackpoint just break computed route. Or did I understand incorrectly? At present I can tap/drag the trackpoint to a new location to force a route recalculation. That is as long as the new location is on the visible map otherwise I have to zoom out/ in. I can be tedious. So my suggestion is that when you tap the trackpoint and the new bottom dialog is displayed, why not allow the position to be changed as well. This would simply be a superset of existing tap/drag functionality but with ability to move the point with all the standard means - exact lat/lon, existing point, select on map etc. For me it makes total sense & seems like the one last remaining part of route planning to improve. Měl bych dva podněty k Manažeru událostí. 1) Navrhuji přesunout do něj i hlášení při automatickém uložení trasy. Je to takové nesourodé, když hlášení o uložení je v notifikacích a hlášení o exportu v Manažeru. 2) Pokud se využívá Locus k záznamu několikrát za den, hlášení o exportu docela zahlcují Manažer. Jedna možnost by byla položky seskupovat, viz scr1. Navrhuji ale spíš doplnit Manažer o hamburger menu s položkou Nastavení. V ní by pak byla možnost zatrhnout zobrazování jednotlivých položek. Viz SRC2. Třeba oznámení o úspěšném exportu do Stravy je zbytečné pokud ji máte nainstalovanou, stejně z ní hned přijde notifikace o nové trase. I just tried google maps on PC and to be true, I do not know about which feature you talk, because to me it looks like there is nothing special compare to what Locus Map do in Route planner.